Thank you everyone for your name suggestions! I really was in a quandary about all your good suggestions. I considered them - and you have inspired me with even more ideas! It reminds me of my Great Aunt Mary's wallpaper! "Really?" you say. Well, maybe not totally and completely. But it makes me think of vintage wallpaper. My dad had an aunt named "Aunt Mary". I remember going with him one time to visit her and her whole house just seemed "old". (I was a kid.) I think this would have fit. Any help you can give me here, I'd appreciate it! Since it is the weekend, I'll collect ideas here and on the Facebook group over the weekend while I relax and do other things. Actually while many of you are reading this, I'm hopefully going to be at an air show! More on that at a different time, though. No, I've not talked about every quilt in between the last one (#32 - Oases) and this one - I haven't talked about #28, 31, and 36. I am working on "Pick a Pocket" featuring pockets when I get in the mood - and am currently cutting strips for a log cabin variation - #39. I am now working with smaller and smaller pieces (except for the pockets and the Hawaiian one since those pieces are cut already) so the tops are taking a bit longer to make. I just need a name. This is a simple idea - these are 5" blocks - one chain block using a bit darker chain with some lighter blue and white stripes (mostly). Then there's a 5" block with a +sign surrounded by white. 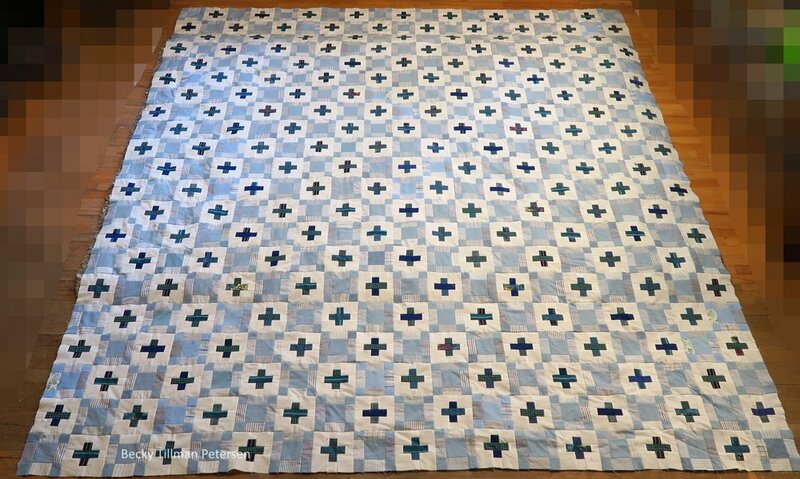 While really quite easy, this was not a quick quilt top to make as there are 399 blocks in this quilt. I had almost enough of that light aqua or blue-green, but not quite enough. I had to add some light blue to the mix to have enough. You notice it when up close, but from a distance, it is okay. The + signs are made out of my darker bluish greens and darker blues and navies. I was about out of the royal blue and navy, so I just made do. I'm actually happy to be "almost out" of these colors. Until then, have a great day! I trust you get to spend some time today in your sewing room.